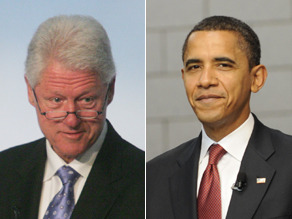 Bill Clinton and Obama spoke Monday morning. WASHINGTON (CNN) - Former President Bill Clinton and Barack Obama talked by phone Monday morning, representatives of both sides said, as the Democrats sought to quash rumors that Clinton holds a grudge against the man who knocked his wife out of contention for the party's presidential nomination. Obama called Clinton and they spoke for about 20 minutes Monday morning, the Obama campaign told CNN. Clinton wants to campaign "with and for" Obama after the hard-fought primary campaign between Obama and Hillary Clinton, Clinton spokesman Matt McKenna said. Clinton "renewed his offer to do whatever he can to ensure Sen. Obama is our next president." Obama "had a terrific conversation with President Clinton and is honored to have his support in this campaign," Obama campaign spokesman Bill Burton said. The chairman of Sen. Hillary Clinton's unsuccessful presidential bid, Terry McAuliffe, said Sunday the former president was angered by media reports suggesting he did not plan to actively support Obama in the general election. "He was angry that these ridiculous stories were out here, and these supposed close friends of the president - none of the close friends ever got called," McAuliffe said, referring to anonymous sources quoted in some stories. "What happens, a lot of time, is people like to pretend they're close so they can tell the reporters that they're close, but, you know, they're just talking." McAuliffe said he spoke to Bill Clinton on Sunday morning. The former president recently returned from a trip to Europe. Obama and Hillary Clinton appeared together Friday in Unity, New Hampshire, where the former first lady said of her ex-rival, "we may have started on different paths ... (but) today our hearts are set on the same destination for America ... to elect Barack Obama as the next president of the United States." The two had met the night before at a gathering of Clinton's biggest political donors, at which Clinton delivered the maximum legal donations to Obama's campaign from herself and her husband and Obama and his wife, Michelle, donated the maximum to Clinton's campaign - which remains mired in debt. But some analysts read bitterness into the fact that Bill Clinton did not appear at either event and had made no personal comments supporting Obama since his wife conceded the nomination. Instead, the former president released a statement through a spokesman saying he "is obviously committed to doing whatever he can and is asked to do" for Obama. McAuliffe said Bill Clinton merely was waiting in order to avoid taking the public's focus off of Obama and Hillary Clinton's joint appearances. "Any time that Bill Clinton and Barack Obama speak, it's going to be big news," McAuliffe said. "They wanted this out of the way first. Now that that's over, they will speak. And I'll bet you they speak within the next 24 hours, 48 at the most." He also joked at rumors that the ex-president remains angry at Obama from the Democratic campaign. "This man doesn't stay mad," he said. "He can get mad for 24 hours. It's his Irish ancestry."